Recently I’ve made several new projects to decorate my kitchen. If you’ve been a reader of this blog for a while, you also know that I have a food blog, Amanda’s Cookin’, and that I love to cook and bake. Because of that, I have loads of different utensils. They were completely consuming my drawer space and getting harder and harder to find, so making these utensil holders just seemed to be a given. Note: I used my Silhouette machine to create the letters and pictures for these, you could definitely print them out on regular copy paper, spray them with clear matte sealer , cut them out and Mod Podge them on. I started with these plastic beanie baby boxes (which of course I washed out first, gross). My husband called me from work one day and asked me if I wanted a case of them that someone was getting rid of. Being the craft supply hoarder junkie that I am, I of course said yes! I apologize that I don’t have step by step photos. My camera batteries choked on me in the middle of the project. I gave them a quick spray with some primer to help the paint adhere to the plastic. Then I simply painted them with Vintage White acrylic paint . I ended up giving them a total of three coats, allowing them to dry an hour or so between coats. I did use a paintbrush and acrylic paint, you could also use spray paint for this. If you have a Silhouette machine , you can use or edit the template – get it here. The font that I used was Lithos Pro, so you could recreate these in Word if you like. Here’s a downloadable PDF file as well. I printed the designs onto vinyl and added them to the containers, being sure they were all lined up with each other. Once I had attached the vinyl I sprayed them with two coats of acrylic sealer (matte finish) , allowing them to dry between coats. For the fabric liner, I simply cut strips of fabric from an old tablecloth and doubled them up using hot glue . Then I glued the doubled fabric to the outside, tucking the extra inside the containers. 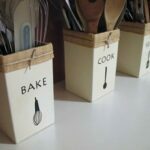 I added a simple piece of twine around the outside of the fabric and my utensil holders were complete! I love the way they turned out. I hope that you like them too! They have been a great way to free up some drawer space and keep all my different utensils separate. I started with these plastic beanie baby boxes￼. I gave them a quick spray with some primer￼ to help the paint adhere to the plastic. Then I simply painted them with Vintage White acrylic paint￼. I ended up giving them a total of three coats, allowing them to dry an hour or so between coats. I did use a paintbrush and acrylic paint, you could also use spray paint for this. If you have a Silhouette machine￼, you can use or edit the template. The font that I used was Lithos Pro, so you could recreate these in Word if you like. I printed the designs onto vinyl and added them to the containers, being sure they were all lined up with each other. Once I had attached the vinyl I sprayed them with two coats of acrylic sealer (matte finish)￼, allowing them to dry between coats. For the fabric liner, I simply cut strips of fabric from an old tablecloth and doubled them up using hot glue￼. Then I glued the doubled fabric to the outside, tucking the extra inside the containers. I added a simple piece of twine￼ around the outside of the fabric and my utensil holders were complete! I love the idea of this craft since I love crafts and love saving space!!! I will have to give this a try soon!!! Very neat idea. I have several pots from amaryllis kits that I use to hold utensils but they are just dumped in there. I like the way you organized them and I am going to decorate them the way you did. i can’t open the files to get these templates. would u mind emailing them to me please? Hi Nat, I corrected the PDF file so you should be able to download it now :) Sorry for the delay! I love love love this!!! Can you send me the template? I cannot open it because it says it doesn’t exist. Thank you!